Dutch designer Sjoerd Vroonland designed this Extension Chair for Moooi, which is a features several “extensions” including a handbag hanger, a card holder and even a coat stand that extend from the top of the chair. It’s a clever piece – especially the fact that it actually solves the “where-can-I-hang-my-bag-so-it-won’t-fall-of-the-chair” problem. 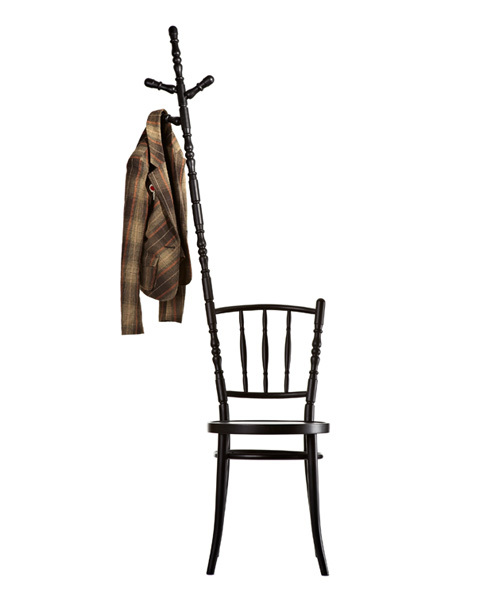 Not sure whether the coat stand will hold up though… However, it is these uses that was the inspiration for this chair! The chair is made of solid beech and is available in black. The handbag hanger comes standard with the chair for US$477, all other extensions are optional and sold separately. The coat stand is sold at US$278, and the card holder at $35. Photos provided courtesy of Moooi.